I’m accepting Daisy’s invite and starting this series of posts on showing gratitude, through black and white photos. 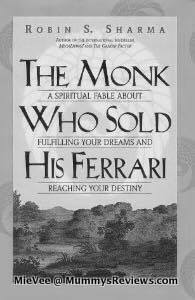 This book “The Monk Who Sold His Ferrari” has sat on my bookshelf for years. I read it halfway and somehow left it that way till I re-read it again in April. This time, my mind was ready. The ideas made a lot of sense to me and I was ready to change, for the better. After decades of being nocturnal, I finally decided to sleep early at around 10p.m. Nowadays, I work till 7a.m. then take a nap with little El till he wakes up at ~9a.m. So I still get enough proper sleep instead of over-working at night. I’m much happier these mornings and ready for the challenges hurled at me throughout the day. So thanks to the author, Robin S. Sharma and Daisy (who runs Trinity Kids Malaysia, possibly the best playschool in KL)! P.S. Feel free to start your own gratitude series too. ? P.P.P. View all this entire series at B&W Gratitude Challenge 2015 here. “The Monk Who Sold His Ferrari” is available in major bookstores and libraries. Disclosure: I bought my own book. I ‘ve just read the PDF version of this book after seeing and hearing about it for the last few years. I read it while the whole house was asleep and I must say, those quiet moments spent reading it, had somewhat opened my heart and eyes to a lot of things that I had previously brushed aside or taken for granted.